A Memorial Day Weekend tradition where families and friends enjoy the creative spirit together! Join all the artists, musicians, and lovers of the arts, young and old, who gather on the grounds of East End Arts and along the Peconic River for this day-long celebration of the arts, centering around the Street Painting Festival, fashioned after the Italian street painters “I Madonnari”, a street chalk art form dating back to the 16th century, as well as activities and entertainment for everyone. 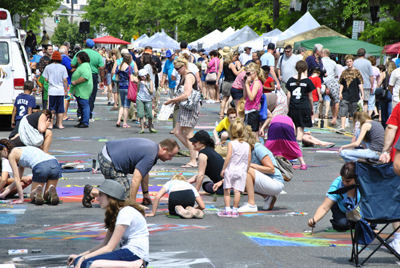 Street painting squares sponsored by businesses, families, and individuals are used as a canvas for inspirations in chalk. Street painters over 14 years of age are encouraged to register in advance. Pre-registered street painters will be matched with a sponsored square on a first-come-first-serve basis. Street painting squares may also be purchased for $20 on the day of the event. Materials included. This entry was posted in Events on April 4, 2017 by BIDadmin.